This week on the Galway chat group (an email group that Sir James Galway emails to once a month or so), he announced a morning scale class that any flutist out there in internet-land may take part in. Well I know some of my students would love to play along,but the challenge is really being aimed at more advanced flutists. The scale book chosen for the challenge is "Exercises Journaliers" by Marcel Moyse, which uses extended scales to high B3 and Low C or C# for all majors and minors. These are high reaching scales and perhaps the world's most wonderfully interesting and modern arpeggios, but there's an easy way to "break them down" into learnable chunks. So help yourself to the pdfs of the sheetmusic that I just created for those novice to intermediate players which translates this to a grade 5-8 RCM flute level. Go to part 2 of this blog post, to download pages 10-21. Go to Part 3 for the third section, pg. 22-39 (major minor scales in thirds) of the E.J. book simplifed by Jen Cluff. All you have to do is warmup well for 20 minutes, with low slow slurred tunes, and easy breathing, to get your best, most ringing tone first, and then, with the most beautiful and creative musicality, experiment with the scales. Of course, you're free to have self-chosen slow tempos and of course, heavenly, gorgeous tone, and play through some of the exercises. Add to your successes by repeating those you can do well a little faster and more richly nuanced, while always breaking down and learning a new exercise that needs to go much more slowly. In my fluterly-teacherly way, of course I advise playing all slurred,before adding articulations. And take slow speeds, observing the most effortless finger motions by breaking the scales into little bites, and insuring fingers stay low and close to the keys, moving lightly without disrupting the flute. You start with chromatic scales, and learn them a little higher each day. Then go ahead, and go totally wild with Debussy-esque whole tone scales, and then, almost Star-Trek out on augmented fifth chords and such, before playing through your typical two octave major scales, and then spending a little time on walking up to high G, G#, A, Bb and at last, high B at the end. When you come back from your break; break apart new things into small "bites" and play them slowly as if they're gorgeous melodies, then start putting them into full scales and arpeggios again. But work intelligently, without fatigue; that's the whole trick of it. ha ha. Yes, really creative, exploratory, and fun if you work up to it gradually and don't force anything. To avoid tendonitis and tennis elbow (Ha ha, sad but true) you have to be in the same relaxed frame of mind that you are in when you're having fun. If you've read The Inner Game of Tennis by T. Gallwey, (read the foreword and intro online.) and you'll see how fun can help everything you do. If you need more, there are also free scale duets and Taffanel and Gaubert exercises from the T&G Daily Exercise book on this blog too. Just use the white search box at right to find more advice on scales if needed. Happy September you with gentle fingers, relaxed arms and holistic breathing. Oooh, lovely! I do need to do more of these. I'm in! I have been looking forward to your updates! Thank you for posting. I have a book of Pares scales which I have been very diligently ignoring. My excuse - I am too new to the flute to need them. And as a pianist I DO know better, so this post is very very much appreciated. Hopefully, scales are back on the 'to do' list. Thanks again. Yes, the Pares Scales are SO so terri-blech! I ordered the book years ago when someone else recommended it as a good basic scale source but it had major problems. d. no hints on how to perform the scales fluidly, or with articulations etc. written out exercises etc. You may think it attracts students to yourself BUT really it undermines that. People will take the FREE information you put up there and NOT pay for lessons. You don't see dentists putting up online how to do fillings or lawyers giving exact details of how to go to court. No. They are guarded about the knowledge that people PAY them to receive. Too bad flute teachers wouldn't do the same. Giving away free information undermines the charging of $$$ for that information. You might want to rethink this giving away of tricks of the trade. I would rather people played flute well, and had free exercises and free pieces to play, then for everyone to be so focused on money and enterprise that this information was tightly restricted. I don't care for economic restrictions. I care for the proliferation of good flute playing. See if you can help, not hinder, when it comes to Art. Dear Anon, Re: giving away for free what could be charged for. Since discussing this topic with a few other flute teachers, it might be of interest to consider some facts. 1. I've never had a flute student arrive in my studio who is there BECAUSE I've had free handouts on my website. The only two who've ever arrived with my free handouts, had never played them, and were awaiting instruction on just HOW to play them. I would assume therefore that those who are willing to come to lessons are willing whether or not they have free printable exercises. Those that play the exercises without private lessons are (as we all know as flute teachers) very unlikely to play them well, and still need lessons regardless. 2. Dentists and surgeons DO put free "How to" videos online. Those videos are necessary to correct common errors. Common errors are only human, but they are well known among experts, and they are the most likely to cause damage. That's why any specialist with a kind-heart ends up educating for free at least in some small degree, to get rid of common human error or common human misunderstanding. 3. 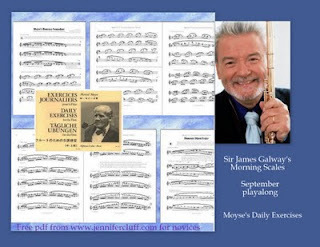 The "James Galway scale challenge" was an actual idea set up by Galway himself, to use Moyse's "Daily Exercises" and then for each participant to write in to the group and say how they were doing with the challenge. Only one person from among the 1500 readers wrote in afterward. Most of the readers were not advanced enough to play the Moyse Dailies. That's why I wrote this novice-intermediate version, in order to give those less developed flutists something to play so they could participate. As far as I know, no one participated...the project died. So if Galway can't get people involved in a scale challenge, who can? 4. 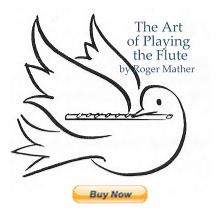 It strikes me that you might be the author of a flute scale book that costs $$$$. If so, I'd love to see some hard facts about how that's going for you. Details of successes, rather than criticisms of free stuff would be more educational for both of us. I'm really grateful for those handouts that you shared. I love to read your post (not read all yet, too much information for a beginner), but I still pay for my flute class! My teacher has her own way to teach me. She teaches me with one ordinary flute textbook (I don’t say which one here) and additional short songs. She likes to teach students more melodies and then let most students develop their own tone gradually. Most of the kid students don’t hear the music while they’re playing. Hence, they’re happier if they learn more songs. But I’ve learned piano for years, so my ears are already somewhat “open” and I really couldn’t bear my terrible tone at beginning. . I was almost going to give up on my flute learning, until I found the information that you and other generous flutists shared online. I tried some of your exercises to develop my tone, and found it really worked and gave me more confidence! Then I bought Trevor's books 1~6, 17 exercices journaliers, …. etc. If I have any time, I would read those books or your blog, maybe I don’t understand the part at the moment. However, occasionally when I have a difficulty on the homework my teacher assigned, I accidently come up with some part I’ve read. I don’t think your sharing suppress other flute teacher’s living. On the other hand, you save them. LOL. By the way, I still like my flute teacher. She still teaches me a lot. It’s really too many things to learn about on my flute learning. I’m sorry I’m from Asia. Hope you can understand my incorrect English. Your situation is familiar. Often beginner flutists who already play piano hear music with much more detail (such as tone, or smoothness, or rhythmic "feel") just as you do. I too start beginners with loads and loads of tunes. Your teacher is likely doing a very good job. So keep up the curiousity and the love of music. This article was aimed at adults, who've played more than six years. It's great!! I downloaded it, but I don't know how fast I should start. I usually play T&G No.4 practice tempo is around 95. So what tempo do you suggest I start with? Play all-slurred for tone, putting pauses wherever you need them so you always play fresh with great energy and musicality. Evenness of tone and fingers is more important than speed. Make the fingers lighter as you gradually speed up the tempo, and eliminate uneeded extra pauses that you used to have. Make the fingers lighter and lighter as you speed the tempo more. Eliminate any more pauses you used to have. When the tone, speed, and lightness are there, add articulations and dynamics to vary from day to day. Ok! I will try this way. Thank you!